Does a Snake Need Sunlight? As coldblooded animals, snakes need help to maintain their body temperatures in the right range to enable them to move and to keep their bodily functions working properly. 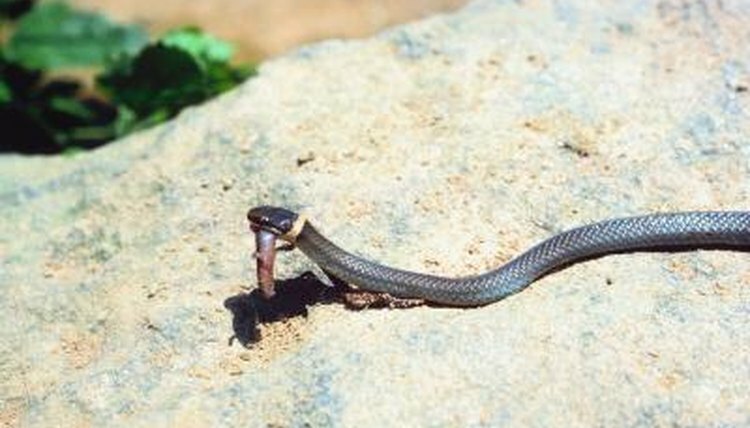 Many snakes bask in the sun to raise their body temperatures. The sun also helps the animals maintain healthy levels of vitamins and minerals. Many snakes prefer to move around during the day, when they can alternately bask in the sun's heat and slither into shadows to regulate their body temperatures. As cold-blooded animals, or ectotherms, snakes rely on the environment to keep their bodies at optimum operating temperatures. When their body temperatures fall too low or rise too high, the snakes become sluggish and their bodies cease some essential functions, such as digestion. To maintain body temperature, snakes need heat, not necessarily sunlight -- but sunlight is a generally the most convenient source of heat for snakes. Some snakes, such as ball pythons, are most active at night, which means they don't need sunlight. Instead, they curl up in warm areas, such as in a hollow under sun-heated rocks, during the day; they absorb heat through their bellies by sitting on top of warmed rocks in the evenings before the heat dissipates from the rocks. The warmth provides the energy the snakes need to spend the night hunting. Like most reptiles, many snakes use ultraviolet light from the sun to produce vitamin D, which is key to keeping a snake's bones strong and his metabolism running smoothly. Vitamin D helps their bodies process calcium effectively. The amount of necessary sun exposure varies by snake species. In the wild, even nocturnal snakes tend to get enough ultraviolet light exposure to meet their needs. Creating warm zones in your snake's habitat lets him choose how much heat he receives. Heating lamps or under-cage heating pads on one side of the habitat develop hot zones where the snake can go to warm up. When he gets too hot, he can slither away to a cooler area of the tank. Adding full-spectrum UVB lights about 12 hours per day provides vitamin-producing benefits -- placing your snake's tank next to a window doesn't give him the same benefit, since glass and plastic tend to block ultraviolet B rays. He might get warmth from the sun through the window, but no vitamin benefit. How Do Wild Snakes Keep Warm? What Do Snakes Need for Survival? Why Do Lizards Often Lie in the Sun in the Morning?